Fujian Province, a leading tea grower in China, has a tea-growing history of more than 1,000 years. There are the eat, north, south, west, and central Fujian tea-growing areas, The most famous tea are the Tie guanyin from Anxi and the Dahongpao from Wui Mountain. The Tieguanyin Tea is grown in Songlintou and Yaoyang in Anxi County, where the first thing the visitor should do is to try the famous. Tea.There are seven steps in tea making and drinking. The visitor may also visist China? largest tea plantation, watch demonstrations of the tea culture, or join the local tea growers to pick tea leaves. 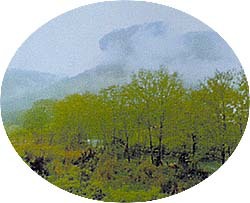 This famous tea is grown in Jiulong Chao, Wuyi Mountaion. There is a unique way of tea drinking in the Wui Mountain area. It is delightful to sit at a table drinking while admiring the tea leaves in the cup. The visitor may also make a tour of the platations or watch demonstrations of the tea culture in the Yihai Song and Dance City.